This past weekend I had the privilege of attending my first writing conference. It was a lovely and inspiring time to learn from amazing faculty, and was capped by a stirring keynote address from author of the #1 New York Times Bestseller WILD, Cheryl Strayed. All of our fabulous instructors (heartfelt thanks to Suzanne Finnamore, Ariel Gore, Theo Nestor, and Candace Walsh) freely bestowed so much collective wisdom, honesty, and generosity throughout the weekend that part of me did not want the weekend to end. But one specific part of me was begging for the conference to be over. My poor note-taking hand was seriously hurting and kept going numb from all the collective notes I was furiously scribbling throughout the weekend. It’s been awhile since I’ve taken substantial handwritten notes, and I didn’t realize how terrifically out of shape my hand was! I had finally found my tribe, a group of supportive, bookish folks all keen on improving their practice in the “craft of writing.” And I wasn’t about to let this golden opportunity pass without taking a ton of notes. Which also got me to thinking about how the profoundly physical act of writing down ideas is so integral for many of us to the process of digesting, understanding, remembering, and passing on information. I don’t remember anything unless I write it down somewhere, as I’m cursed with a terrible short-term memory. So if I want to have a shot at remembering anything (good writing tips and practices, sage advice, etc.) I have to write it down… immediately! Otherwise whatever idea or concept introduced instantaneously evaporates into ether. I also happened to notice that most of my fellow retreat participants fell into three main categories when it came to taking notes: 1) the Keyboarders, who efficiently tapped out notes on their laptops/tablets/iPads, etc; 2) the pen and paper Scribes like myself, furiously scrawling through hand-cramps; and 3) the Absorbers, folks who simply leaned back and listened most of the time during the workshops and speeches, and who only jotted down stuff during specific writing exercises, etc. As a messy Scribe, I usually require a large college-ruled notebook to contain my frenzied handwriting. Most people have a hard time deciphering my handwriting, which probably explains why I did well in blue book exams in school, as the TAs probably had no idea what the heck I was writing, and gave me the benefit of the doubt. Writers seem to like their Moleskines as much as innovative eye wear, coffee, and alcohol—and no wonder with the notebook’s self-proclaimed associations with Wilde, Hemingway, and Picasso. But mostly it’s just a pretty snazzy-looking pocket notebook with a cool elastic band. I bought my first Moleskine in 2006 at a Dymocks in Hong Kong. And I remember at first only wanting to jot down notes in pencil so that I could erase typos and misspellings. (After all, it was expensive bound Italian paper!) I’ve since gotten over it, but for me, this small black notebook symbolized what I aspired to be: someone who noticed things and who wrote them down. I wouldn’t go so far as to call myself a writer (unless you count mind-numbing credit research reports that no one ever reads) but my little black Moleskine represented the association of writing with romantic notions like travel and adventure, departure and arrival. Either way, it’s just a notebook. But I still have a hard time writing messily and freely in it versus my regular “utilitarian” spiral bound notebook. While my little black Moleskine will always remain my “nice” notebook, I guess I might just start calling it my “luxury” notebook from now on. So yeah, I probably won’t be taking messy notes in it either since I’m definitely hanging onto my trusty spiral-bound. And I’m still waiting for extreme note-taking to count towards my weekly cardio requirement. A special shout out to all the instructors and participants at last weekend’s retreat: Thank you! May you be inspired and invigorated as I was. hmm… i am definitely a keyboarder. i was writing thank you cards the other day and found that writing with a pen felt so… tedious. i also don’t remember anything unless i write stuff down- hence, the blogging. so i type up my life, save it to cyberspace, and promptly forget the details! not as romantic as writing in a moleskin i guess, but it’s free! I’m also a handwritten note taker. However, as you know, I threw caution to the wind when Cheryl Strayed spoke. This might have been so that I could absorb it or I was totally not interested in trying to balance a notepad on my lap and listen at the same time. It felt freeing to not take notes, but I’m pretty sure I will be dependent on others in order to remember what she said. It would be practical if I took notes on my netbook but somehow it just loses the romance. I want a slightly worn notebook, defined by things on the front that capture me or at least are more fun to look at than a plain notebook. What makes me laugh the hardest is that I have spent time thinking about this and I am pretty sure no one else cares what my notebook looks like! 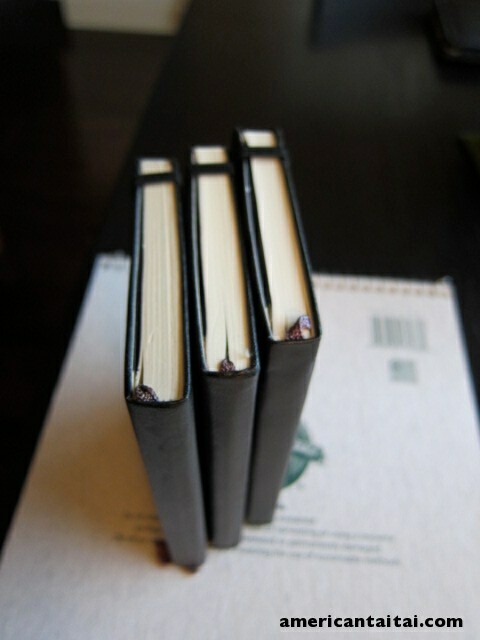 As for the moleskin, you clearly have gone the “cool kid” route with your writerly notebook. I’d suggest if you totally want to embrace this image, you also get a ridiculously expensive pen. Totally finishes the look. Very cool that you got to go to a writing conference! I recently started taking extensive handwritten notes for a story that I’m working on, and my hand cramped up so badly that I couldn’t keep going after about 45 minutes or so. It’s a little sad to think that before the advent of computers, when I was still in elementary school, 45 minutes of writing was probably no big deal. Same idea goes for being able to spell – I’m afraid I’ve gotten so used to automatic spelling correct correct that my brain is getting weaker, too! Hi Sam! Yes, the 45-minute mark is my limit too!! I also grew up in the pre-laptop/pre-internet age, and so everyone wrote by hand, and physically looked stuff up in dictionaries and encyclopedias! You’re spot on with a 45-minute writing exercise being no big deal. Yes, our hands and minds are growing out of shape. That’s why it’s good to go for a reality check and a hand-workout once in awhile at a conference or for a project. I can’t imagine how people in the past did research or wrote papers and books before the computer, writing out everything by hand and then typing it out on a typewriter… yikes. Thank goodness for technology! Thanks for stopping by! I’m glad you found a writer’s conference you enjoyed. Many people love these events, and that’s great, I just don’t seem to be made for them. Mostly I wanted to escape to go write – talking about writing in large groups seemed mostly antithetical to learning about writing, and much more about finding support for writing, which is an important but very different thing. As far as notes: I’m like you. If I’m typing it’s a different experience. If I’m liveblogging and plan to publish a writeup quickly I’ll use a laptop, but always realize my absorption of what’s being said will be very different: more precise but also more shallow. Any interest in forming a group of active bloggers in Seattle to meet for a beer now and then? Absolutely, I would totally be interested in forming a group of active bloggers in SEA for a meet up. I have a couple friends who’ve been talking about it, but we’ve never been very regular about it, and it would be nice to kick around some ideas about how we each do things in terms of process. Let’s do it! Are you around the next couple of weeks? I can kick around a few dates and locations if you’re up for it. Jealous of your whole writer’s weekend! I recently dipped my toe in the “writers’ world” here in Hong Kong by joining “Hong Kong Women in Publishing” and attending an event. I felt a bit like a poser, but was secretly giddy as hell! Hi Jen! Hahaha, good for you rocking a HK Women in Publishing event! 🙂 Woot! Honestly, I was kind of awestruck when I met Cheryl Strayed in person, and she was totally approachable and genuine and humble in addition to being a literary rock-star. And all the other instructors were equally impressive, and everyone was so down to earth, I was pleasantly surprised. Never been to a writer’s conference. Thanks, Angela, for this nudge, and the reminder about handwriting, a great way—a timeless way—to mix up the act of writing. Hi Nate, thanks for stopping by, and for the great tip on the Leuchtturm1917 lines. Ooooo, very VERY cool! 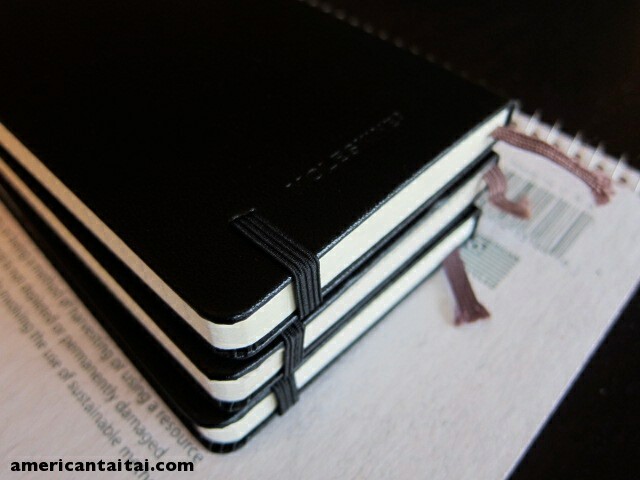 These look to be a step up from Moleskine. Will have to check them out. And yes, somehow I find that hand-written notes sometimes changes my thought process vs. typing on the laptop, in a good way. I think it has to do with less self-censorship since there is no delete button! Thanks for your comment!